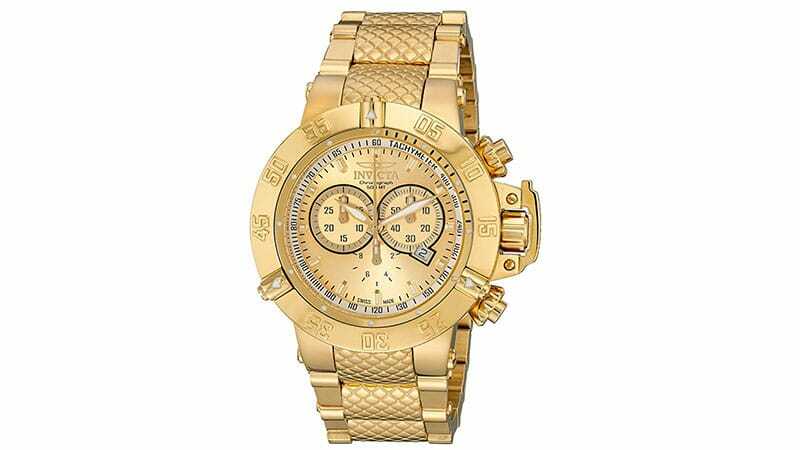 Gold watches project confidence, prestige and power. 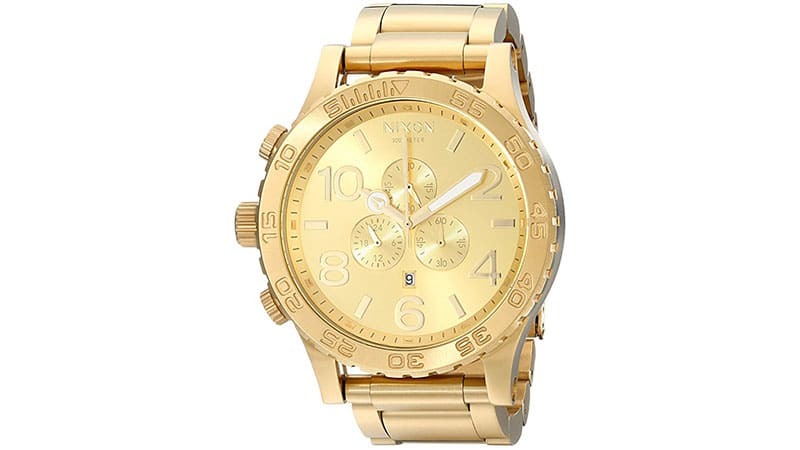 This is precisely the reason why the thought of wearing a gold tone watch around your wrist may be incredibly appealing. 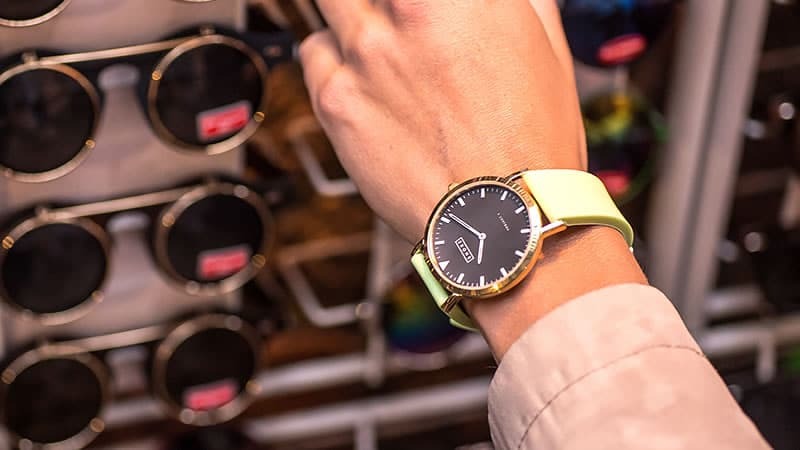 Whether you’re a minimalist or a city-slicker, these sophisticated timepieces promise to keep you on schedule and your outfit on point. To help you find the best model to enhance your style, we’ve assembled a list of the best gold tone watches for men. The Tag Heuer Aquaracracer proves that diving watches needn’t be black and bulky. 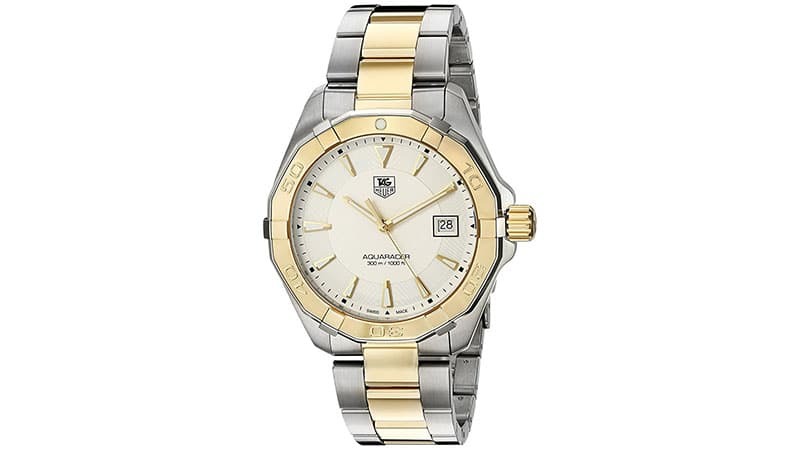 This stylish two-tone timepiece is made of brushed stainless steel. It features a unidirectional bezel and a 40.5-millimetre case with a non-reflective and scratch-resistant sapphire dial window. With 300-metre water resistance, the Aquaracracer is perfect for activities like scuba diving. Its stylish design won’t disappoint at the office either. 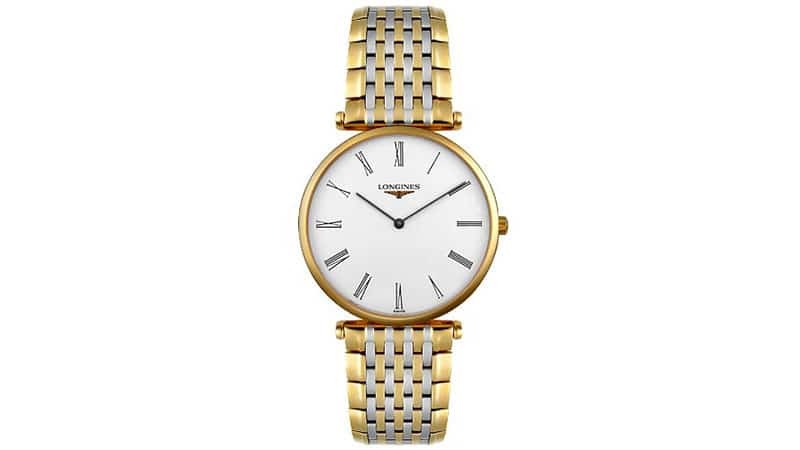 The La Grande Classique de Longines watch collection is the epitome of elegance and style. It features a two-tone stainless steel band and a crisp white dial with the iconic Longines logo, two black watch hands and Roman numeral markers. The minimalistic yet high-quality make of this watch portrays luxury, confidence and taste without overstating. 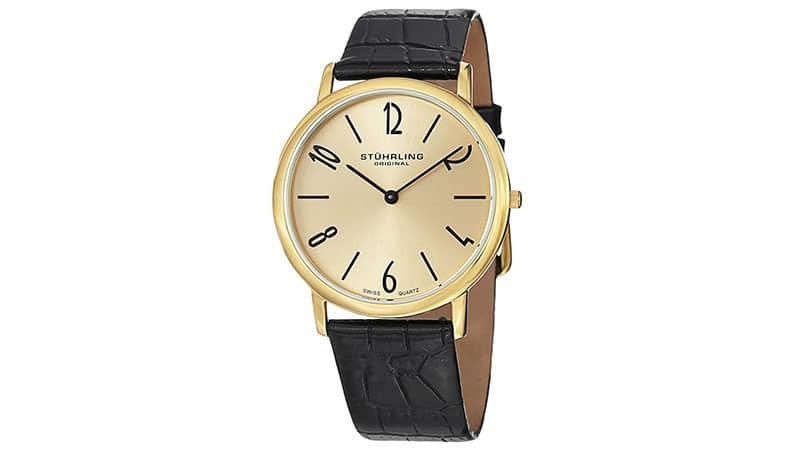 While the overall design of the Stuhrling Original Ascot II is kept mostly simple, it does feature a somewhat abstract typeface on the dial, which contributes to the classic and yet unconventional charm of this timepiece. The body also features a 23-karat coating of yellow gold and a highly-durable Krysterna crystal window. For more than 25 years, Casio’s G-Shock series has been known for its long-time performance and durability. 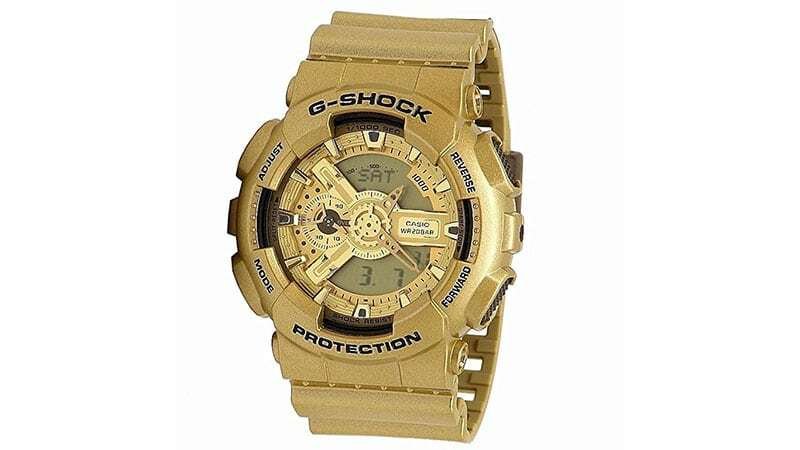 Now, this classic G-Shock style comes with a golden makeover. While every outside feature boasts a gold-tone finish, this sporty model still embraces all its core values on the inside. Among them: 10-metres fall endurance, 10-bar water resistance and a 10-year battery live. In the watch department, it doesn’t get much more sophisticated than the Victorinox Maverick. Made of hypoallergenic stainless steel and anti-reflective sapphire crystal, this watch is built to stand the test of time – and attract a few admirers in the process. Equipped with a unidirectional rotating bezel, count-up scale, tachymeter, date window and three subdials, the Maverick is ready for anything. The design of the Seiko SNE036 takes a more simplistic approach to time-keeping. The wristwatch features a sophisticated gold-tone finish. However, that’s not the most attractive feature this piece has to offer. 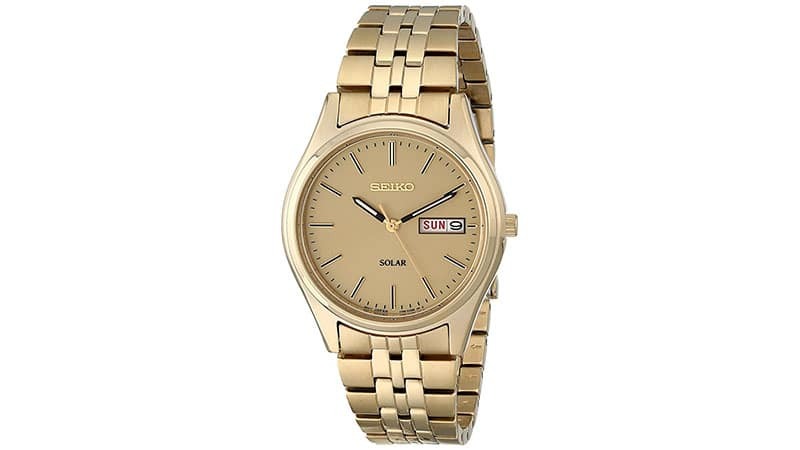 This Seiko is equipped with high-performance solar cells, which generate electricity through various light sources. In addition to that, it runs on an energy-efficient quartz movement with a long power reserve. 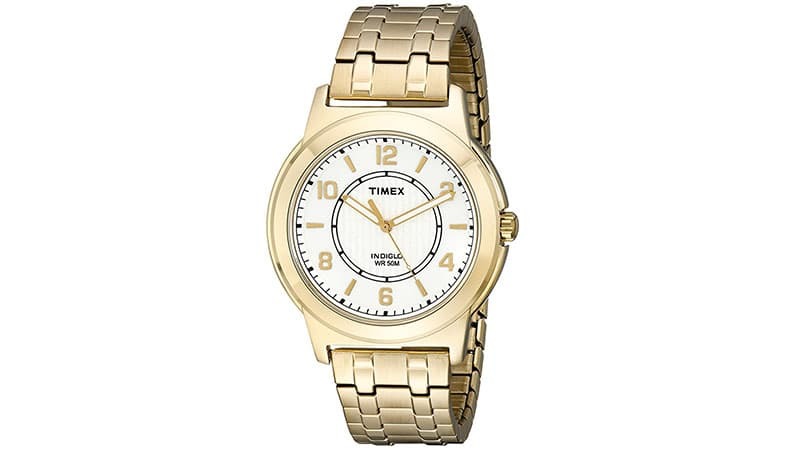 The Timex Bank Street gold-tone watch is the ideal choice if you’re after a sleek and sophisticated accessory that will take you effortlessly from day to night. In addition to the adjustable stainless steel bracelet, the Bank Street features a 40-millimetre brass case with a mineral crystal cover. The dial itself boasts Indiglo, which enables you to read the time in dark surroundings. If you like fast cars, you’ll undoubtedly love the Ferrari Scuderia Speciale 3H. The timepiece features the unmistakeable sleek, Italian design for which this brand is known. 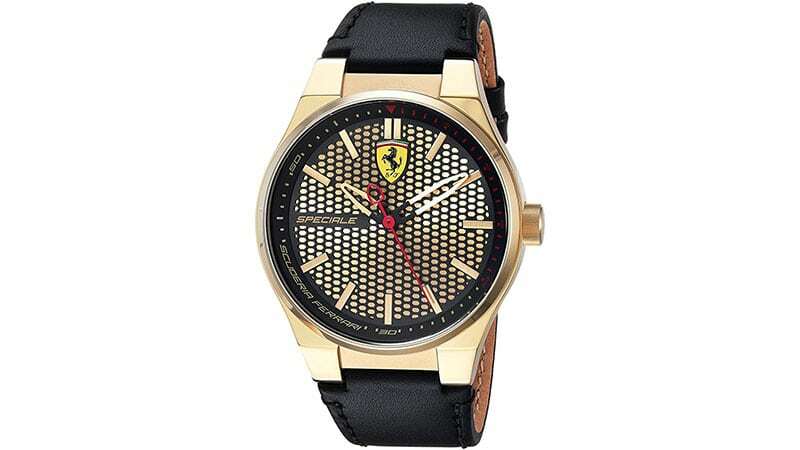 The watch dial features gold-tone sunray indices on a honeycomb textured dial, which resembles the monocoque construction or front grill of Ferrari race cars. 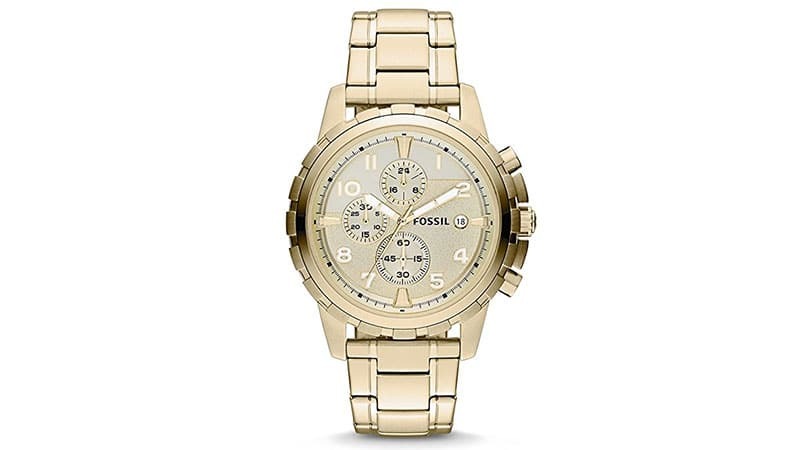 The light gold tone of the Dean watch by Fossil adds immensely to the luxurious feel of this piece, while the sizeable 45-millimetre case and its chronographic features maintain a distinct sporty vibe. Just like the Diesel Mega Chief, the Fossil Dean has luminous hands and numbers in addition to three subdials and a sharp gear-edge bezel. The Invicta Subaqua Noma III can undoubtedly live up to its strong name. Held in place by a textured stainless steel bracelet, the watch body features 18 karat gold ion plating. It also boasts a unidirectional bezel, a tachymeter scale, chronograph subdials and 500-metre water resistance, making it the perfect adventure companion above and under water. If you’re after a classic dress watch to add a little ‘je-ne-sais-quoi’ to your look, the Tommy Hilfiger 1790874 should be your pick. 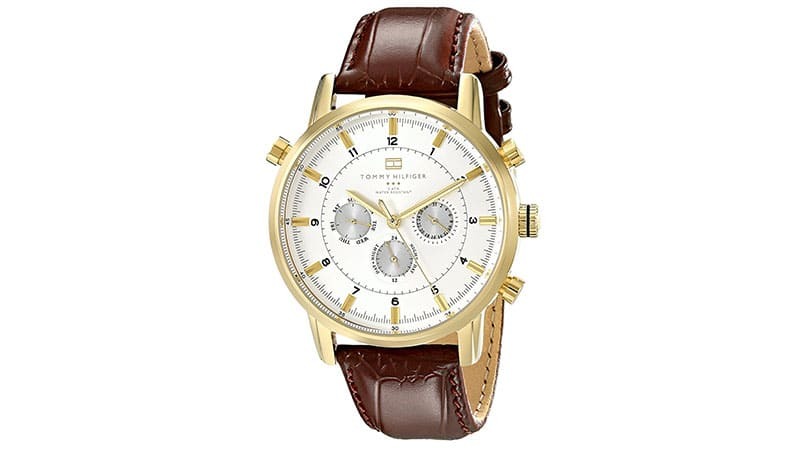 The subtle gold-tone of the case and the mahogany leather strap made from calfskin are a winning combination. In addition to this, the watch features a detailed sunray dial with three subdials indicating the time, day and date. 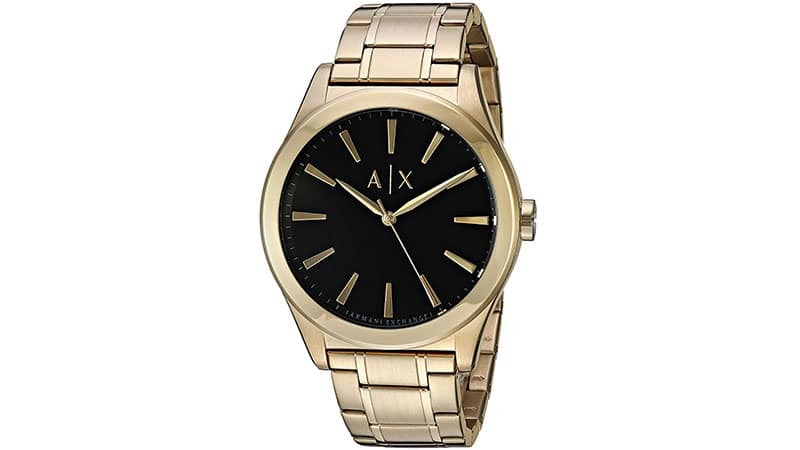 The Armani Exchange AX2328 merges a classic design with a luxurious finish. This timepiece is the perfect finishing touch for a sleek nine-to-five or formal look. The brushed gold-tone plating provides a stunning contrast to the deep black dial while some careful detailing contributes additional texture and visual depth to the watch. The Citizen BI5012-53E is the perfect everyday watch. Its sleek, understated yet chic design suits every occasion, including both work and play. The big 40-millimetre display with a three-hand system and a discreet date window provides an easy time reading experience. The Nixon 51-30 Chrono is for gents who like to live an active life but don’t want to compromise on luxury in the process. With 200-metre water resistance, this timepiece will stand with you through rough waters as well as your casual morning run. The extra-large 51-millimetre dial features three subdials as well as luminous hands for increased time-reading comfort after dark. 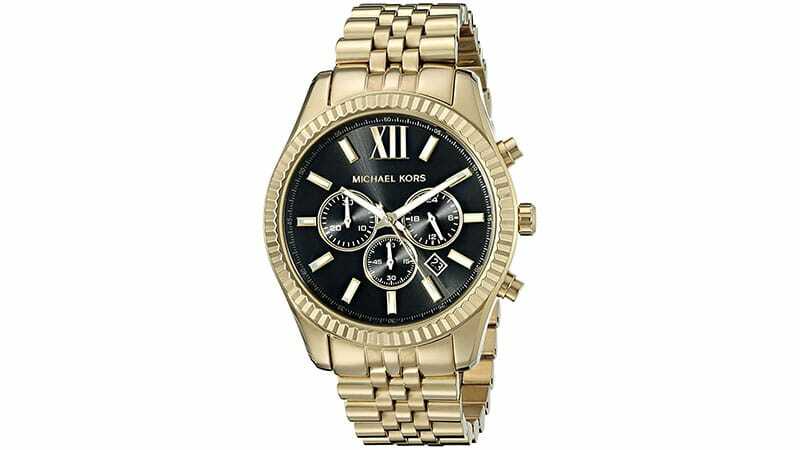 The Lexington by Michael Kors is an exquisite piece of design. The wristwatch features a complex five-link stainless steel wristband that holds the 44-millimetre gold-tone case with a mineral dial window. The dial itself convicts with a textured bezel, bold hour marks and intricate chronograph subdials. 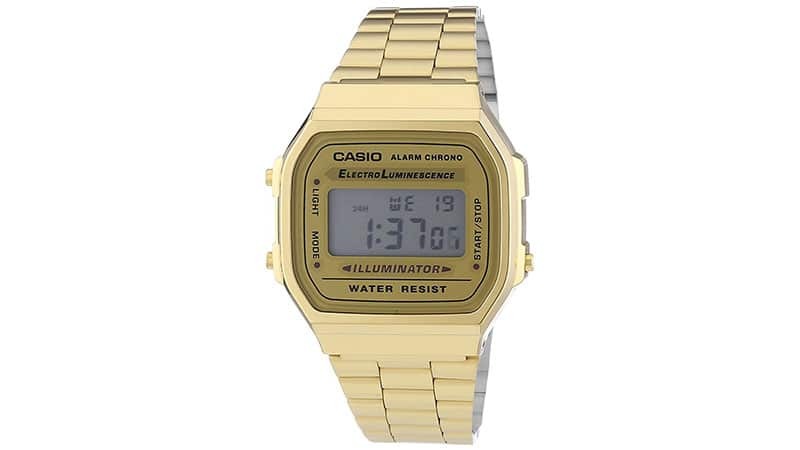 If you’re looking for something with a little bit of character, opt for the Casio A-168WG-9UR. This charmer is sure to add a vintage touch to any outfit choice. Whether you’re on a professional or personal errant, this watch is three things in one: a timepiece, a stylish accessory and an excellent conversation piece. 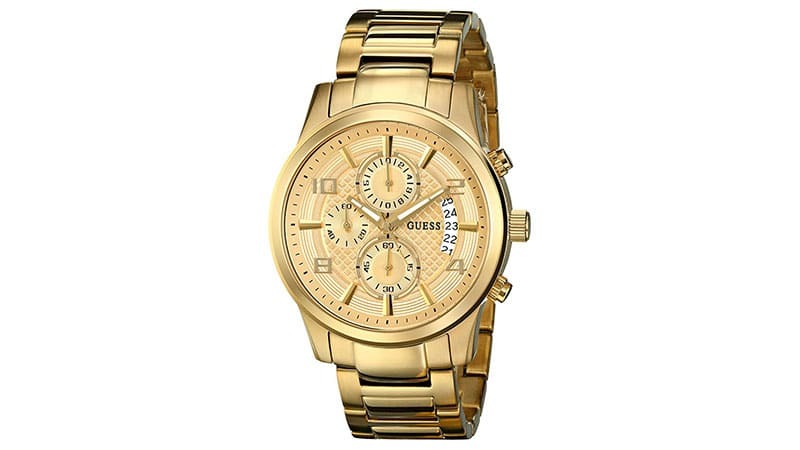 The Guess U0075G5 is a stylish wristwatch with a built-in chronograph. Its sleek and minimalist design makes it a timeless statement piece that will accessorize your look flawlessly at any time. The dial features detailed design elements that contribute depth and texture to the watch face. In addition to the three subdials, it also features an enlarged calendar window. The Bulova Marine Star embodies pure elegance and sophistication. 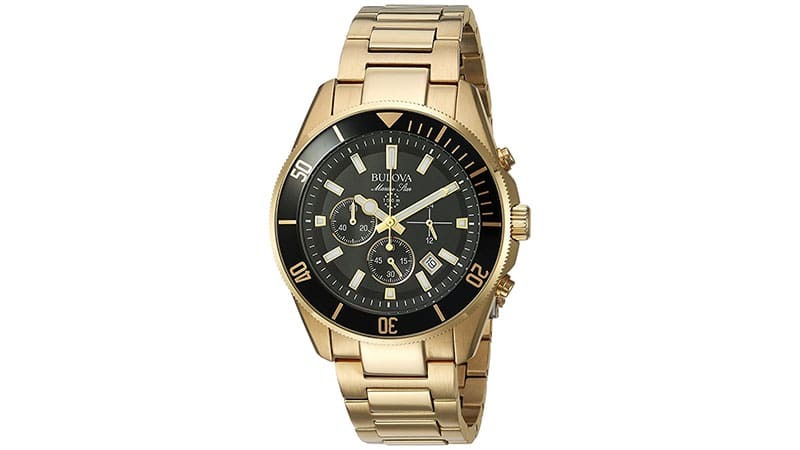 It features an adjustable brushed gold-tone link wristband and a large black dial with gold accents. Both the indices and the hands light up in the dark for better visuality at night. The watch also boasts chronographic functions. 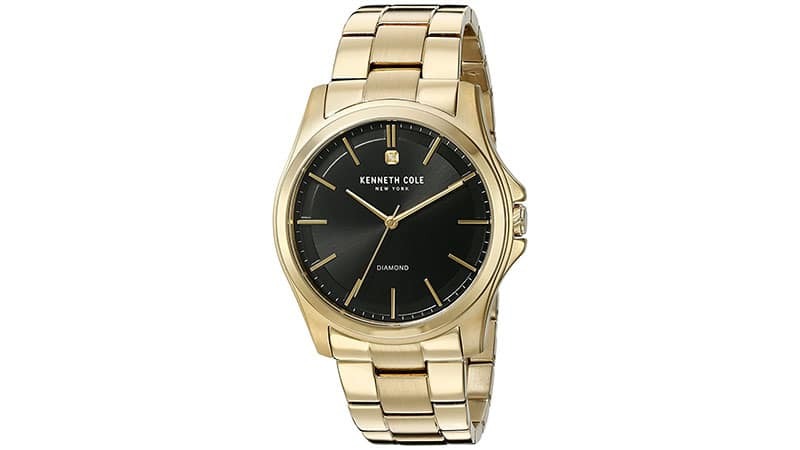 The Kenneth Cole Diamond Rock Out gold-tone watch proves that luxury needn’t be apparent. 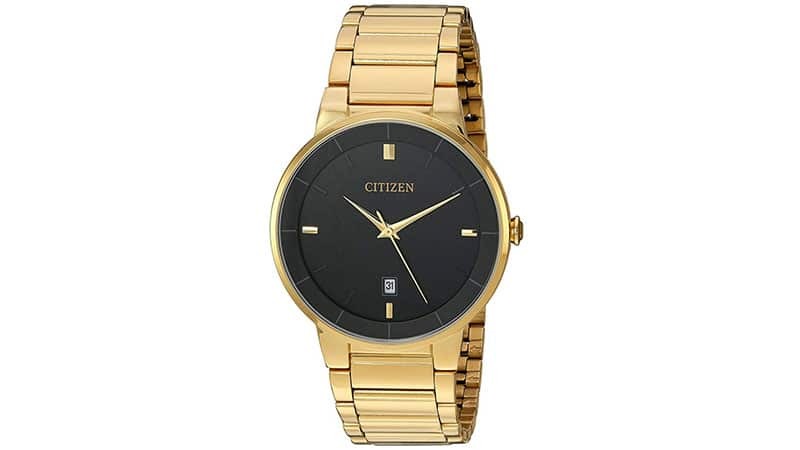 The timeless and minimalistic design of this timepiece begins with the high-quality stainless steel link bracelet and finishes with the sophisticated black and gold watch body. The dial also features a white diamond at 12 o’clock. 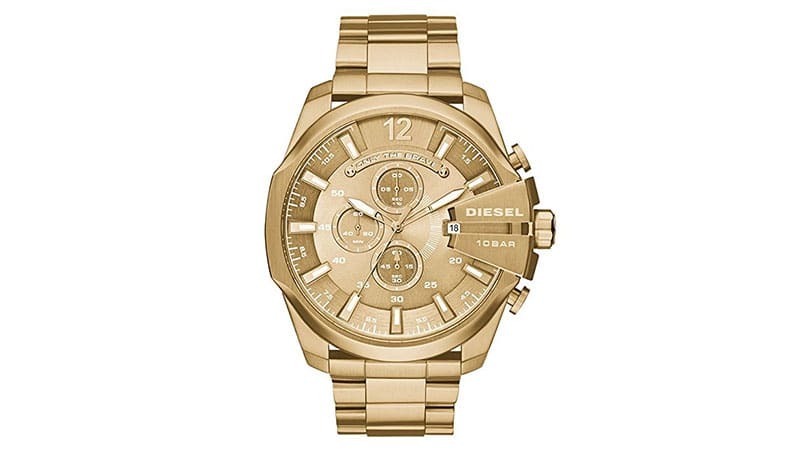 The Diesel Mega Chief wristwatch is perfect for the man who is out to make a lasting impression. The intricate design details of this watch are skilfully brought together by its monochromatic gold finish. The dial features luminous hands and indices, a date window and three smaller chronograph dials. With a watch like this, you’re bound to be the chief in town!